Earnings are company profits and an essential ingredient in determining valuations. Typically reported on a quarterly per-share basis, earnings per share (EPS) numbers tell shareholders how the company is performing. In addition, companies with fast-growing earnings typically trade at higher prices, or price-to-earnings (P/E) ratios. Slow-growth companies usually have lower P/E ratios. Since faster growth typically justifies higher stock prices, it’s somewhat surprising to see the broader market rally sharply when overall earnings are expected to stagnate or turn negative. But that’s what happened during the first quarter; while the S&P 500 rallied 13% in Q1, analyst estimates for overall earnings fell 7.2%. According to FactSet, year-over-year earnings for the first quarter are expected to show a decline of 4.2%. The Energy sector is expected to post the biggest decrease in growth, down 20.1%. Yet, in terms of share prices, the sector is outperforming (up 19% YTD) because Crude Oil is rallying to five-month highs. The Materials sector has also seen a sharp drop in earnings expectations, but solid share gains across the sector. Meanwhile, cuts to Apple (AAPL) and Intel (INTC) EPS estimates are key reasons why the Technology sector is expected to see earnings growth contract by more than 10%. Yet the tech-heavy NASDAQ 100 is up 19.3% YTD. 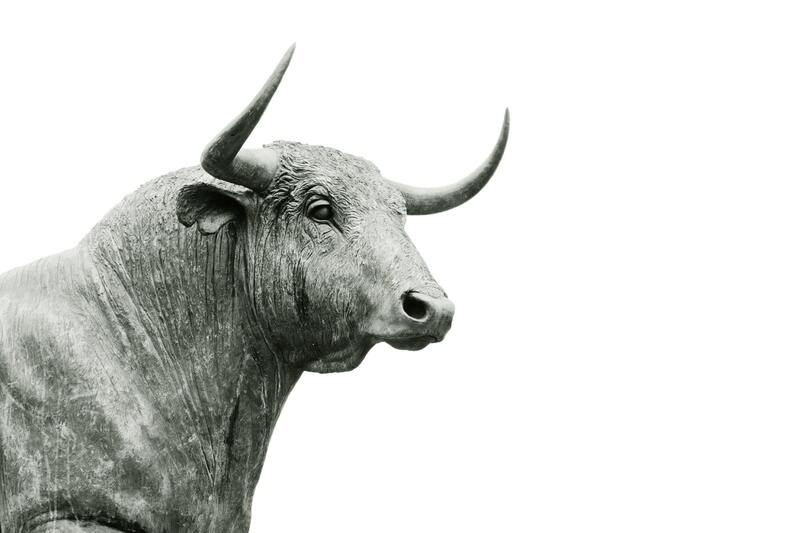 Financials, Communication Services, Consumer Staples and Consumer Cyclicals are also expected to report weak results. In fact, analysts expect just four sectors – Industrials, Healthcare, Real Estate and Utilities – to show year-over-year earnings growth for the first quarter of 2019. It’s possible that the bad first-quarter numbers were “discounted” in the fourth quarter of 2018. The daily chart of the S&P 500 eMini June Futures (below) shows a sharp decline from early October to late December; the S&P lost nearly 20% during that time. Because the stock market is usually a forward-looking mechanism, the recent contraction in earnings was possibly “priced in” during the market selloff in late 2018. By the same logic, the rebound in the first few months in 2019 reflects expectations that earnings will improve after the dismal Q1. The S&P 500 rallied 23% from its December lows and nearly recouped the entire loss from the months before. 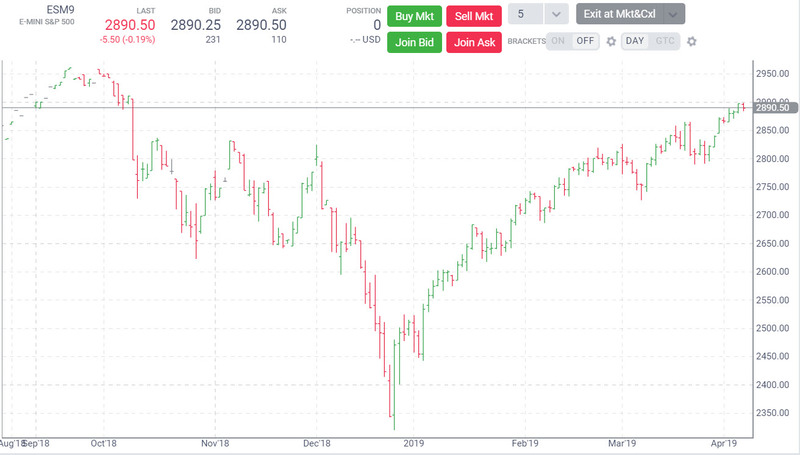 After successfully holding the 2800 level in late March, the new magic number for ES heading into the earnings reporting season appears to be 2900. If the massive turnaround in the S&P 500 in the first quarter is built on the premise that the first quarter represents a cyclical trough for earnings, and growth will return in the second half of 2019, actual first-quarter results will be telling. More important, any guidance companies offer for the outlook going forward will shape expectations about the future. In other words, the sustainability of the S&P 500’s latest rally and any attempts to break 2900 might very well depend on what companies in the sectors with the worst Q1 earnings (Energy, Materials and Technology) suggest about the outlook for the remainder of 2019.